I have a weakness for rusty old motorcycles and the open road. This goes back many years, to the mid-sixties when I rambled around Europe on a military 1943 Ariel 350. It just gets in your blood, and today, forty years later, that ancient “Bogirokkitok” is still running, though hibernating in my native village, Volda. For the last five years I have indulged in a passionate affair with what eastern europeans lovingly know as a “Molotoff”. 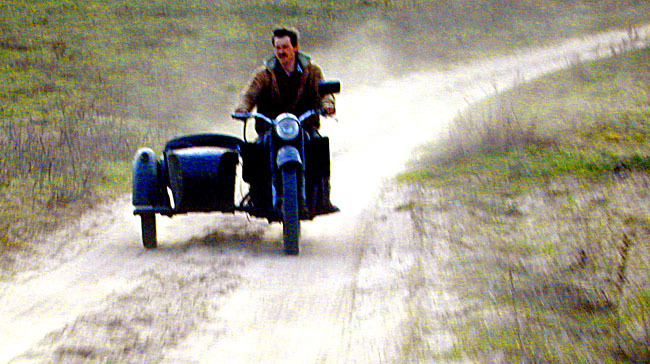 It is a 750 sidevalver with sidecar built in Kiev, officially known as a K-750. I found it on a remote farm in Lithuania, and the fellow refused to accept more than fifty dollars for what he regularly used as a tractor, hauling firewood and potatoes, pigs, and what not. Since that day this bike has taken me along to see and experience more than I could ever have imagined. This last summer of 2005 we finally rumbled into Vardø, a magical little fishing-town in arctic Norway. The northgoing road ends here, and the seas begin. Now it’s November, and the long night of winter has settled in. There is plenty of time to recall past adventures, and to dream up new ones ahead. I have heard it said from a traveler more seasoned than myself: “The interruptions ARE the journey”. In that sense, this Vardonian interlude is just one of many episodes on the way, though a welcome one. I have chosen to spend some time here to learn skills that will allow me to stay on the road in a more permanent sort of way- I am referring of course to my misadventures in virtual reality, accounted for elsewhere. But in the meantime, here is a chance at last to tell stories from the road, and to show some of the many friendly faces that welcomed a wayfaring stranger. Somehow it seems appropriate to begin with a photo of Raymondas taking his bike on one last ride- from his farm to my cottage in the woods of the Dzukian countryside. For me this moment was the beginning of a not-so-casual relationship with Russian so-called “engineering” . . .
Raymondas takes his Molotoff on one last ride. Now it’s my turn.